When visiting area photographers, make sure you meet with the photographer who will be photographing your wedding. 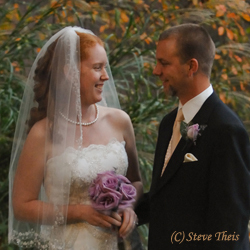 Steve and Chris Theis photograph all of their Masterpiece weddings personally, with an associate, from start to finish. Find out how long the photographer has been in business. You want to hire someone with many years of experience. Choose your photographer on quality not price. View their work so that you can appreciate the value you are getting. Look at the albums and other products available. Theis Photography uses Art Leather and Leather Craftsman albums. Both are guaranteed for your lifetime. You also have the opportunity to purchase the entire set of 5x5 originals at a substantial savings. 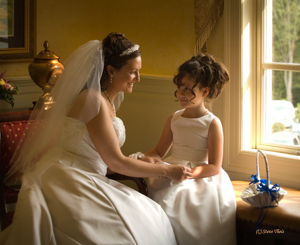 Several of our wedding packages also include a Bridal Portrait. We have several beautiful locations as well as an indoor formal setting. You also have the opportunity to display your bridal portrait at your wedding reception and receive an additional discount. Be sure to ask for details. To see what past wedding clients have to say about our services click here!